Murray Lundberg is retired from a couple of decades working as a motorcoach driver/guide and later as a cruise consultant. He occasionally takes contracts for photography and travel writing, and as well as running the ExploreNorth Blog, is a regular contributor to the Destination BC blog. With his wife, two dogs and a cat, Murray lives on forested acreage at the edge of Whitehorse, the capital of Canada's Yukon Territory. Bella and Tucker are the dogs (both rescues) who live with him, and are his companions for almost all expeditions into the backcountry. Experience: Murray has been active in nature and heritage conservation efforts since the late 1970s. In 1985 he visited the Yukon and Alaska, flying his own small plane, and fell in love with the country - five years later, he moved to Whitehorse. He has now travelled extensively and conducted educational tours throughout the Yukon, Alaska and the western Northwest Territories, and has been a regular speaker on cruise ships in both Alaska and the Caribbean since 2005. 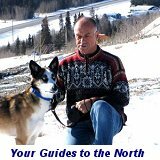 He is also the author of a local mining history, Fractured Veins & Broken Dreams, another about the Alaska Highway, the e-book Murray's Guide to the South Klondike Highway, and has edited several Northern titles. Heavily involved in community affairs for many years, he was an Auxiliary member of the Royal Canadian Mounted Police from 1994-1997, and has served on several community boards including Block Parents, the Whitehorse Heritage Advisory Board, the Yukon Quest Sled Dog Race and the Yukon Transportation Museum. He also served as an elected member of the South Klondike Local Advisory Council while living full-time in Carcross for several years. Education: A self-described "late bloomer," Murray returned to school at the age of 41, and graduated with honours from Yukon College, in the field of Northern Justice and Criminology. From Murray Lundberg: "I came to the conclusion a few years ago that I was born a Northerner, it just took me 40 years to get home! The more of this amazing land I see, the further I want to explore, and the Internet now allows me to share that passion. I'm always available for questions - just email."